The Sinamics G120P is specifically tailored as a converter solution for use in industrial applications in the process industries such pharmaceuticals, chemicals and also building technology. New power modules, PM240P-2 and PM330, have now been introduced which extend the portfolio for built-in and cabinet units at the 400 and 690 voltage level. These complete the product series, providing a consistent approach with identical functionality across all voltage ranges. With its robust design and maintenance-free configuration, the Sinamics G120P is now also suitable for use in extremely harsh industrial environments at operating temperatures ranging from -10 to +50/60° C. It comes with an exceptional efficiency level of over 98 percent, testified in compliance with the EN 50598 energy efficiency standard, and its process reliability has been enhanced by a range of new safety functions. The new PM240P-2 power module is used for IP20 protection rated built-in devices in the 22 to 132 kilowatt output range, and for control cabinet mounted devices with a protection rating of between IP20 and IP55 in the 75 to 132 kW output range. For cabinet mounted converters, use of the module reduces the required control cabinet width from 1,000 to 400 millimetres. 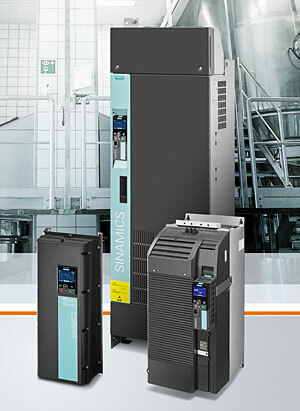 With the PM330 power module, Siemens is extending the Sinamics G120P portfolio up to 630 kW. Applications include use in pumps, fans and compressors with variable torque characteristics in the lower and medium output range for simple and continuous movements. The Integrated Drive Systems (IDS) approach allows components in the drive train to be selected as early as the development phase. Using this method, system losses can be reduced by eight percent simply through the correct choice of drive. Alongside a variable-speed device fan and a new design for the internal power supply modules, the impressive energy efficiency improvement is achieved primarily as a result of optimised pulse patterns. Depending on the operating mode, the magnetic flux in the motor can be adapted to the current load conditions or to an energy-saving standby mode, allowing an additional reduction in energy consumption. New safety functions integrated into the power module provide for enhanced process reliability. One example is the “Safe Torque-Off” (STO) safety function, which reliably switches off the power module without the need to disable the main switch. The “Safe Stop 1” (SS1) function powers down the drive to zero speed before it is switched off. Both safety functions have been designed to provide the highest safety integrity level SIL3. The Sinamics G120P can be seamlessly integrated into the Simatic controller, allowing it to utilise all the benefits of TIA (Totally Integrated Automation) such as open system architecture, worldwide standards and data transparency from the field to the control level.